SAN MATEO (March 28, 2013) – Duck Duck Moose, creator of educational mobile apps for children, has launched More Trucks, a sequel to its popular Trucks app. Trucks, introduced in May 2012, has garnered Parents’ Choice and Children’s Technology Editors’ Choice awards and outsold Angry Birds for iPad at launch. The new More Trucks app teaches children about construction, stacking, sequencing and problem solving as they drive a fire or tow truck, race monster trucks and build structures with a crane. Each activity is designed to encourage experimentation and stimulate the imagination of children ages two and up. More Trucks is available on the AppStore for iPad, iPhone, and iPod touch ($1.99). Trucks and objects move, fall and bounce as they would in the real world, teaching children the principles of gravity and physics. For example, in the junkyard, the stack of cars will topple if the pile gets too high or imbalanced. More Trucks features an array of lively original music that was composed specifically for this app – from jazz, blues and surf, to rock, country, reggae and classical. The music is performed by a diverse selection of live musicians. In addition to original compositions, there are also re-imaginings of classic children’s tunes such as Hurry Hurry Drive the Firetruck, Farmer in the Dell and more. More Trucks is Duck Duck Moose’s 16th title since Caroline Hu Flexer, Michael Flexer and Nicci Gabriel founded the company in 2008 to address the difficulty of finding educational apps for their own children. The Duck Duck Moose collection includes visually stunning and kid-tested apps that teach nursery rhymes and songs, introduce early learning concepts in literacy and math, and encourage open-ended creative play through drawing and storytelling. More Trucks 1.0 is only $1.99 USD (or equivalent amount in other currencies) and available worldwide exclusively through the App Store in the Games category. 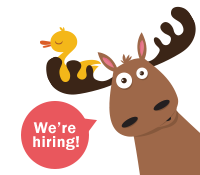 Founded in 2008 by three friends, Caroline Hu Flexer, Nicci Gabriel and Michael Flexer, who share a passion for education, design, music and play, Duck Duck Moose creates some of the most-loved educational apps for children. From Wheels on the Bus, its first title, to Draw and Tell, a teacher favorite, the company’s apps have sustained top rankings in the iTunes and Android stores, and have been honored with 15 Parents’ Choice awards, 14 Children’s Technology Review Editor’s Choice Awards, and a KAPi award for the “Best Children’s App” at the 2010 International Consumer Electronics Show. Copyright (C) 2008-2013 Duck Duck Moose. All Rights Reserved. Apple, the Apple logo, iPhone, iPod and iPad are registered trademarks of Apple Inc. in the U.S. and/or other countries.